We’ve looked at the Rail Terminal, now it’s time for the bus terminal! How do they compare? Let’s find out. I guess flying superheroes ride the bus too, according to the logo! 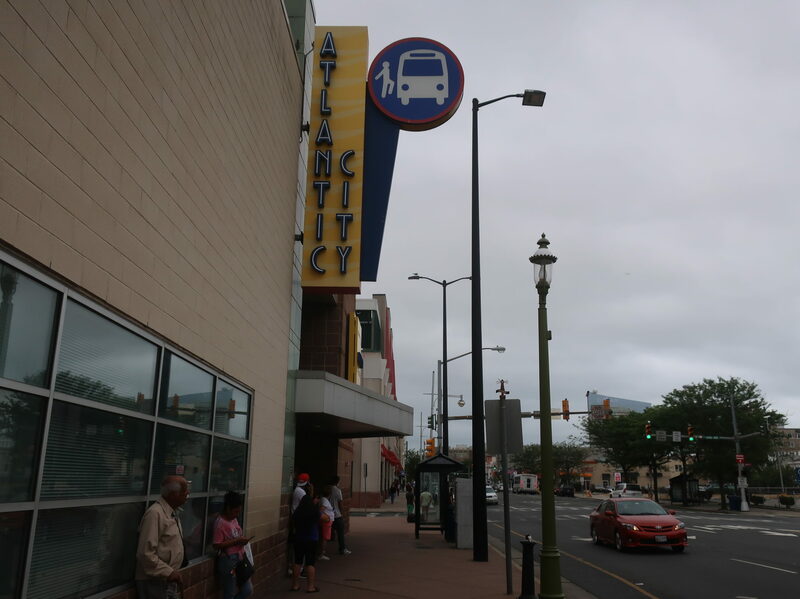 The Atlantic City bus terminal is mostly reserved for NJT’s longer-distance routes, but all the local routes still stop outside the terminal. It’s a very simple layout: two shelters, one for each direction, on the far side of the intersection. That does mean that if you’re trying to go eastbound on a local route, you have to cross two streets, but it’s not a huge inconvenience. More of an inconvenience is that if you’re trying to go westbound on a local route, tough luck, that shelter has no bench! Oh well! Upcoming departures for these routes are shown on a screen just inside the terminal. 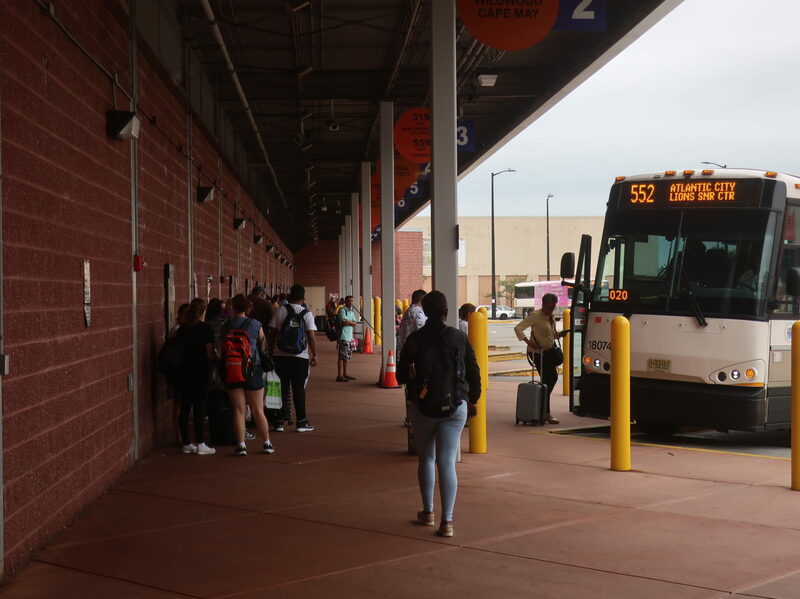 Because the buses in Atlantic City run more often than twelve times a day, the main terminal area tends to be busy. There’s a ton of stuff in here, too: benches, wastebaskets, a big clock, departure boards, schedules, vending machines, bathrooms, water fountains, and ticket offices and machines for both NJT and Greyhound. The respective ticket offices are open 24/7, too (or “12:00 AM – 11:59 PM” in Greyhound’s case), which is a huge plus in a 24-hour city like this one. Everything has a slight level of dinginess that you would expect from a bus station, but there was nothing egregiously bad. The terminal even has a cafe! The boarding area is what you would expect. It’s all sheltered, and there are well-labelled berths saying the name of the route and where it goes, but that’s about it for stuff out here. They obviously expect people to wait inside the terminal rather than outside, and the terminal has plenty of seating, so there’s no reason to have benches out here. 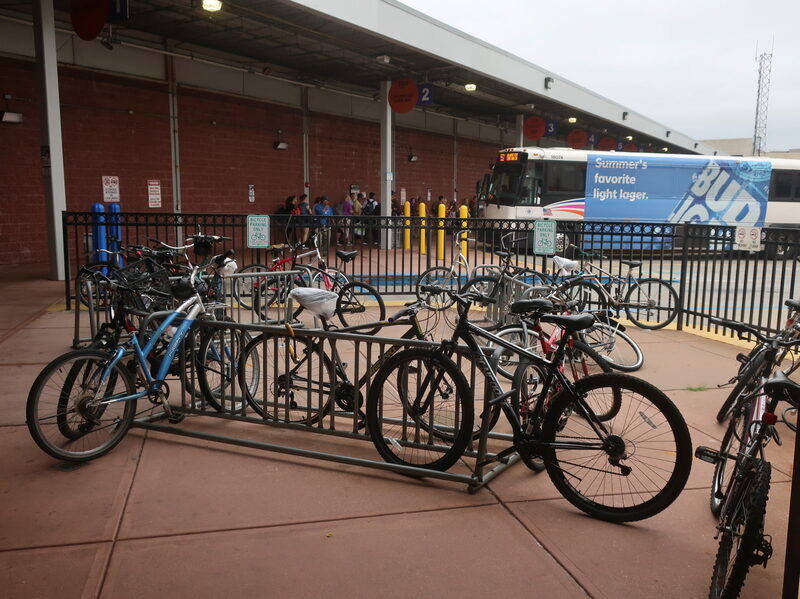 The station also has a ton of bike parking, and it gets well-used (although based on the photo above, it seems like people don’t know how to park a bike properly!). Ridership: Couldn’t tell ya. But based on the number of buses that run out of here and how busy the terminal was on a Saturday morning, I would say it gets a lot. Certainly enough to justify the amenities this place has. 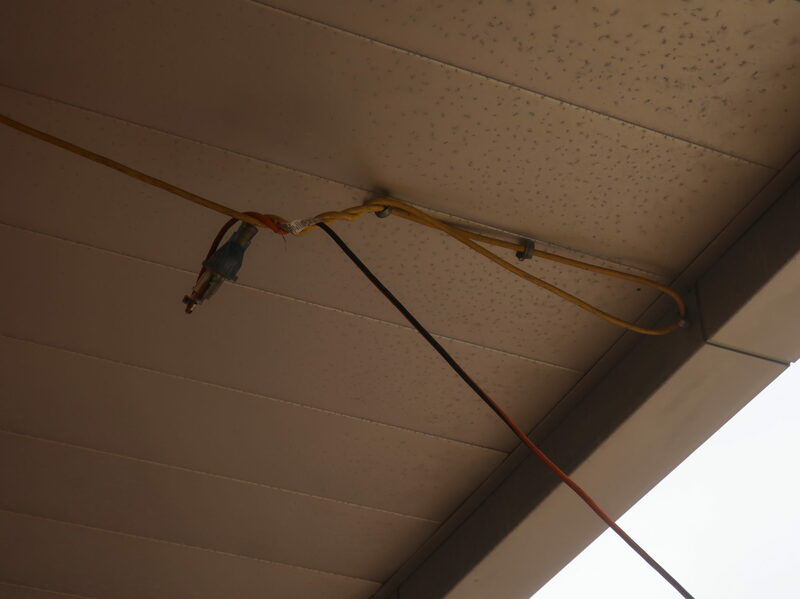 Pros: Yeah…it has a lot of amenities! I listed them above and I’m not going to do it again, but any basic needs one would have while waiting for the bus are covered here. Plus, I love how the whole thing is open and staffed 24/7 for both NJT and Greyhound, backing up the overnight services on both of those systems. There has got to be a better way to set that up. Nearby and Noteworthy: It’s Atlantic City. The terminal is two blocks from the Boardwalk and its casinos. It’s everything you would ever want. 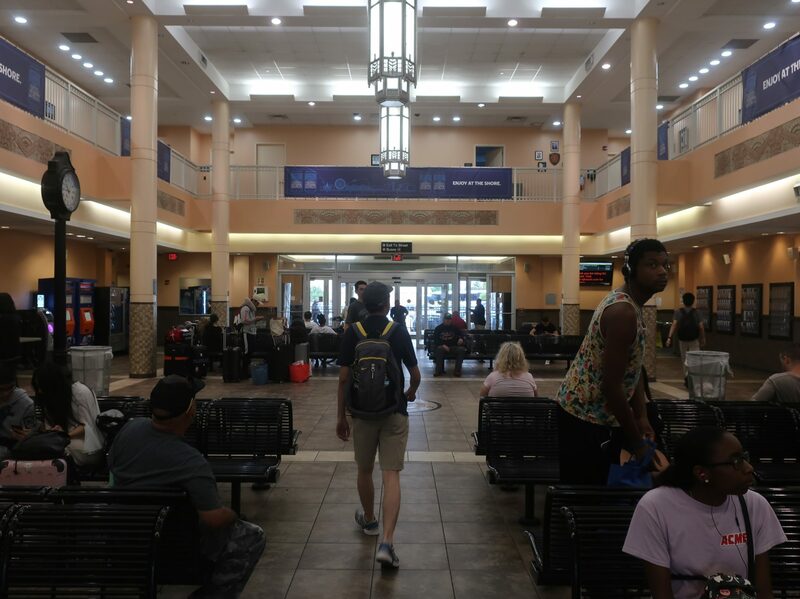 Assuming you’re getting a Greyhound or one of NJT’s longer-distance routes, you’re all set – the terminal has everything you need. If you’re getting one of NJT’s local buses from here…well, have fun waiting in your potentially benchless shelter. Sorry about that.